In June I shared a personal story about my original career dreams while I was in college. I just knew I was destined to be a stock broker and begged my parents to let me invest some of their savings when I was as young as 12. Had they listened to me, they would have gotten in on Coleco BEFORE Cabbage Patch Kids became the must-have toy of the 80’s and I would have gone to a much better university. I hold no ill feelings, everyone has their own risk tolerance – and who in their right mind trusts the financial advice of a preteen!? We regularly get emails from small and first-time game publishers looking for help with awareness of their upcoming game. Right before our trip to Gen Con I received one of these messages from Seth Van Orden of Nauvoo Games about his new game, Stockpile. Because of my personal interests in the financial world, I have played quite a number of finance and stock market-related board games over the years. Not just Monopoly and Easy Money, but hobby-oriented titles like Acquire and Boxcars. With so many games introduced each year and only so many hours in a day, we obviously can’t play and write about all of them. But there was something in Seth’s message that showed how proud he was of his game – enough so that I had to try it for myself. 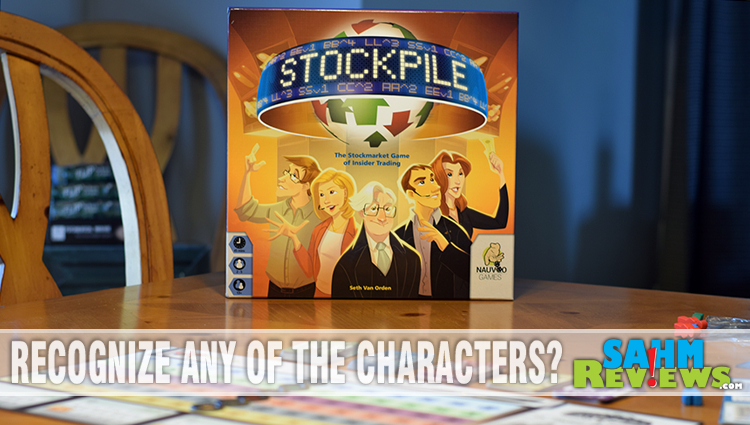 It is not often that a designer’s first game is good enough to be considered a “hit”, but I’m going to start out by saying that Stockpile definitely qualifies as one. I have a number of good things to say about it and very little criticism (which I’ll get to later), but let’s take a look at it and see if it is something your budding Warren Buffet would enjoy. Stockpile bills itself as “The Stockmarket Game of Insider Trading”. And while cheating the market isn’t necessarily something we want to teach our kids, it is a fact that it is a part of the real world. 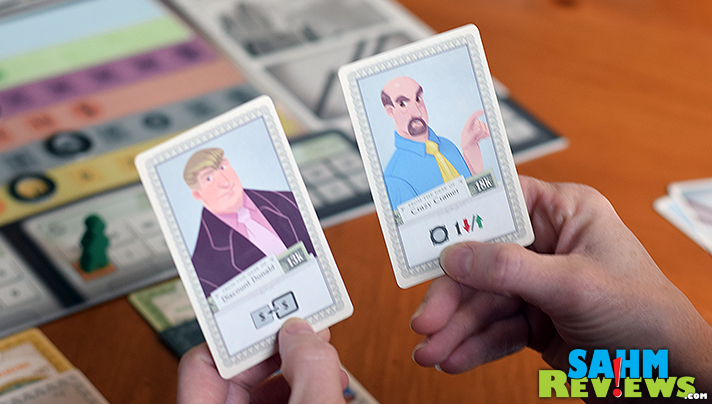 Additionally, you can play as a semi-real world character such as “Billionaire Bill”, “Crazy Cramer” or “Wise Warren”, some of what I would call the “good guys” (Gates, Jim Cramer and Buffett respecitvely). You can also embrace your dark side by becoming “Mayknow Martha” (Stewart) or “Broker Bernie” (Madoff)! Your choice of characters comes with special abilities that may or may not help you win the game. 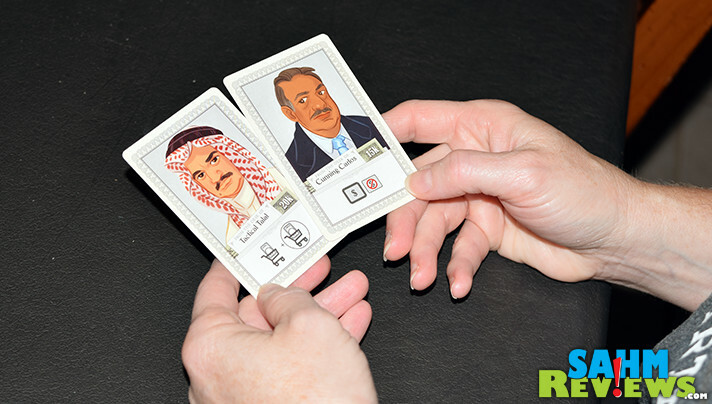 Played over a number of rounds, each round is divided up into a set number of actions that take place. Every player received some “insider information” about one of the six stocks in the game. They will know ahead of time the movement direction of that particular security – information they can use to decide on whether to sell, hold or buy more of that company. Everyone also receives two market cards that they will place into one of the baskets of securities to bid on. Most of these cards are additional certificates, but might also be extra trading fees the winner must pay or boom/bust cards that allow you to manipulate the price of a security of your choice. Each player then takes turns bidding (and raising bids) on each basket until there is one bidder on each group of cards. After all trading fees have been paid and any stock prices moved by the collected boom/bust cards, you must then make a decision on whether or not to sell some of your stocks before the end-of-round price movements (determined by each players’ inside information as well as the public information about each company). Because the object of the game is to end with more money than the other players, buying and selling at the right moment is critical. In the example above, you know that the price of Leading Laboratories will increase by 4, so it would be wiser to hold your cards (for now) or bid higher if you see any in the stock baskets. If a stock’s price reaches the right end of its line, the stock splits! Every share you own is now worth double (two shares)! If you’re unfortunate enough to be sitting on a security when the black marker reaches the trash cans on the left, the company is bankrupt and your shares are discarded as worthless. The number of rounds (draw, bid, sell, move prices) is determined by the number of players. 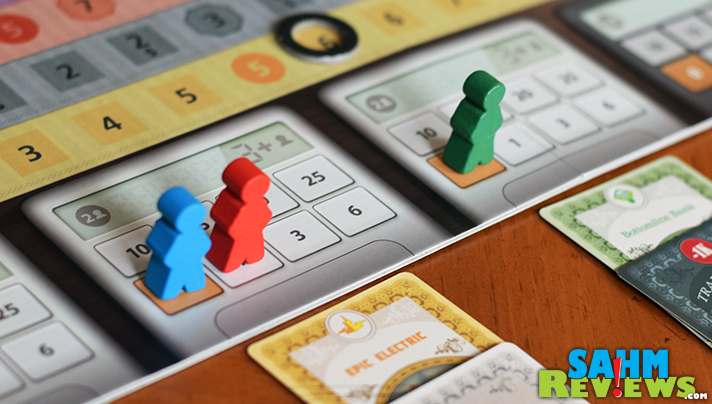 Stockpile nicely supports up to five players, and you can expect the game to last under an hour even with the full compliment of people. Turns are very quick, and because price movement might affect you AND your opponents, there are plenty of “gotcha” moments, especially if you’ve kept good track of what stocks the others are buying. So what was the drawback I mentioned earlier? It is so minor it is hardly worth mentioning. 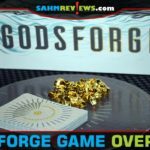 You know I like my game components perfect, and even have gone as far to make replacement currency when I thought the supplied version was inferior and created additional pieces when the game didn’t supply enough. There is one piece in Stockpile that annoyed me a bit – the date marker. 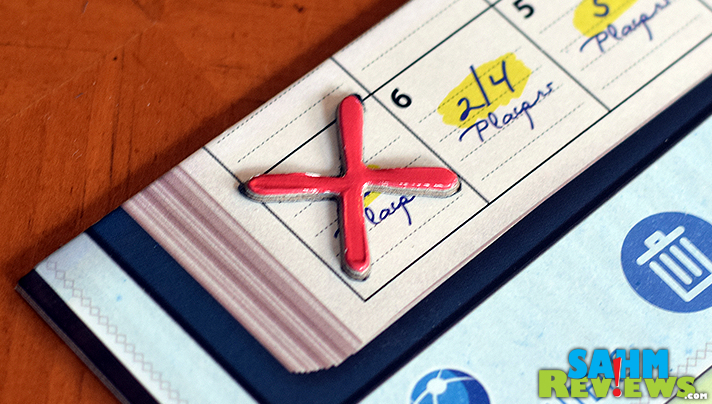 This is a piece of cardboard certainly intended to represent a hand-drawn “X” on a calendar. As you can see when punched out, it is very thin and the printing chips easily. I applaud Nauvoo on their attempt of authenticity, but I can see this piece being damaged way too easily. Or even worse, lost because it is so light it will get knocked around without anyone noticing. I will definitely be on the lookout for a plastic (or metal) piece to replace it, maybe out of an unused tic-tac-toe set. See, I told you I was being too picky! I don’t think I’m going too far to say this is currently the best stock market related game out there. 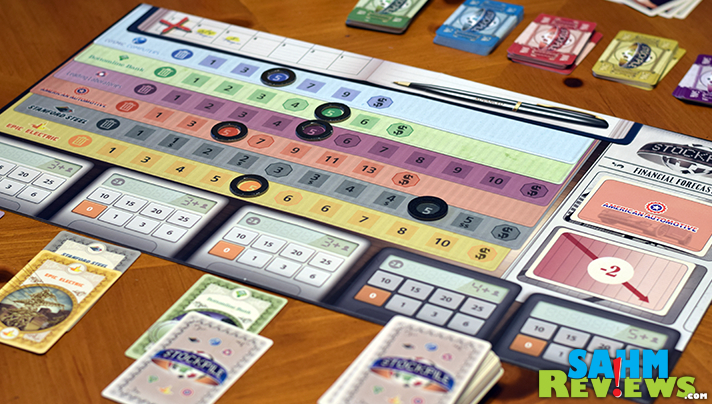 Market movements feel authentic and the inclusion of an easy and advanced double-sided game board will keep both newcomers and experienced gamers happy. It comes as no surprise that Stockpile was a huge hit at Gen Con and will be available at Essen in very limited quantities (only 45!). 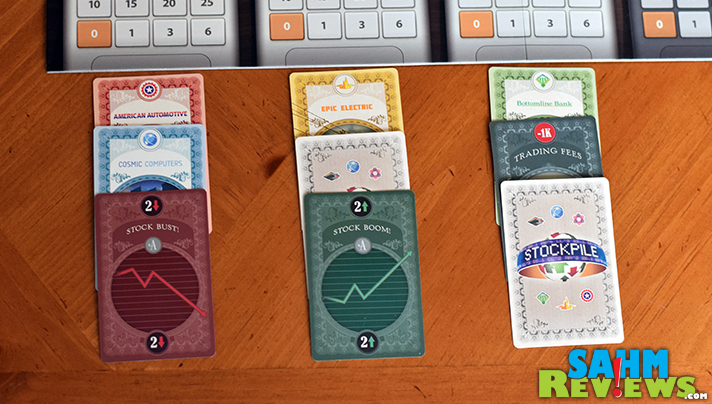 If you’re looking for a game that is fun, strategic and will teach your kids the basics of how the stock market works (and shouldn’t work), then Stockpile is absolutely your best choice. 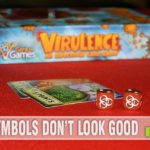 You can find them on Amazon also with limited availability or directly from Nauvoo Games on their website. 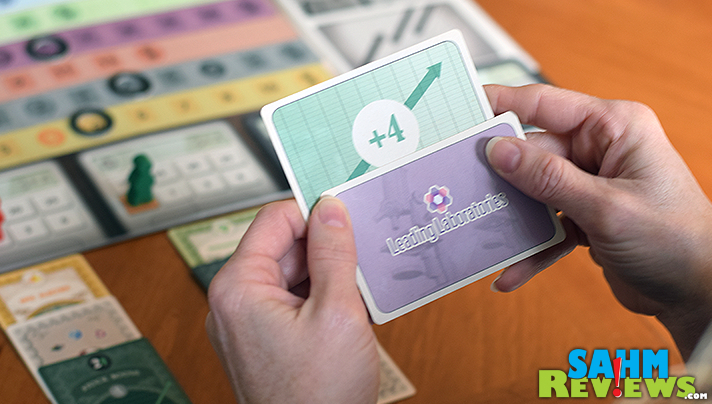 We hear rumors of another game in the works and maybe an expansion to Stockpile, so be sure to follow them on Facebook and Twitter to see what’s in store! This year brought the release of the hinted-upon expansion. 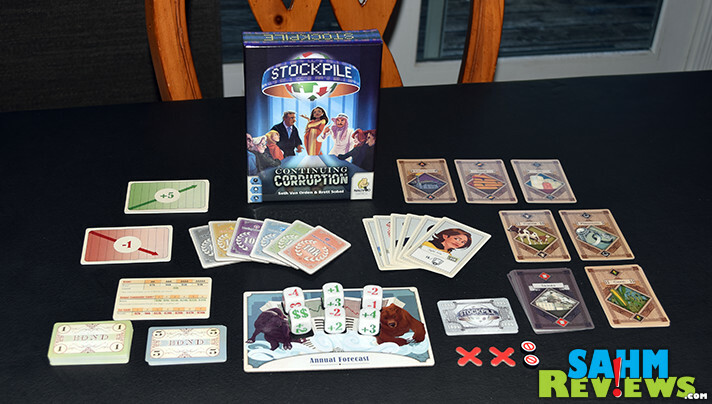 And following an up-and-coming trend in the game industry, the Stockpile: Continuing Corruption box includes not one, but four optional expansions that can be added one at a time or in any combination to customize your session of Stockpile. Plus a bit of an upgrade to something we complained about! The first add-on is the inclusion of six new characters to play, each with brand new abilities. Cunning Carlos must be outbid by at least two spaces on the bidding track, while Tactical Talal may sell again at the end of the Selling Phase. Other characters receive extra interest on their bonds or money for each unique company they own. The next option is to add in brand new Bond cards. These expand your portfolio by providing a risk-free way to earn interest. As in real life, they are the safe road, but you might miss out on huge runs in the stock market. They’re best used as a diversification and not a complete investment strategy. Another way to diversify is present in the third expansion option – Commodities. 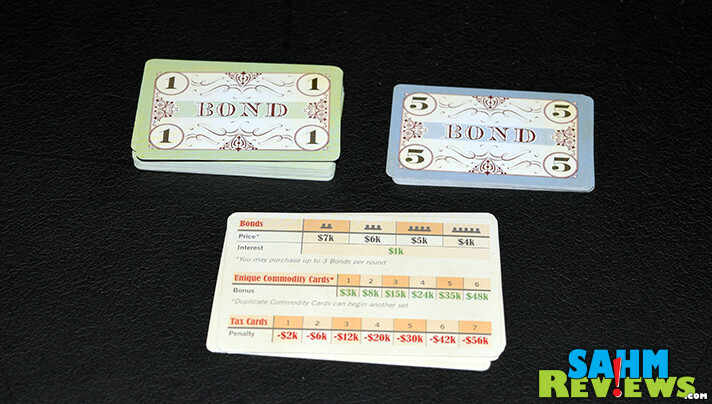 Earn end-game bonuses by collecting cards of cattle, corn, natural gas, oil, platinum and gold. With commodities comes the introduction of taxes. These special cards cost you money at the end of the game. Lastly there are Forecast Dice! Sixteen new Forecast Cards are added to the ones in the basic game and a new Annual Forecast Board is added to the play area. 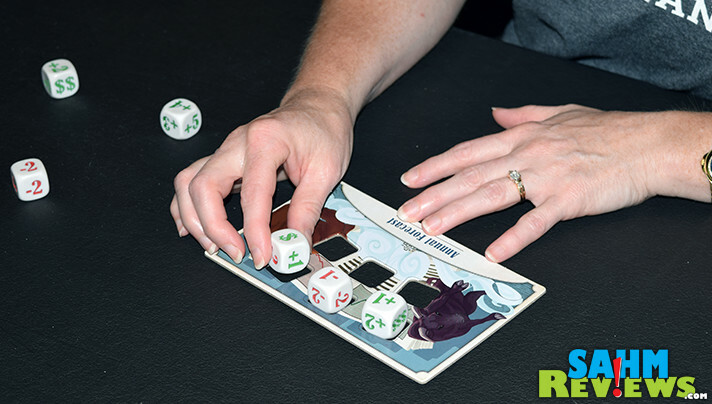 After Bonds are purchased, the first player rolls all six dice and places them onto the Annual Forecast Board. Forecast Cards corresponding to the values on the dice are selected and shuffled. These are then randomly drawn and matched up to Company Cards as in the basic game. 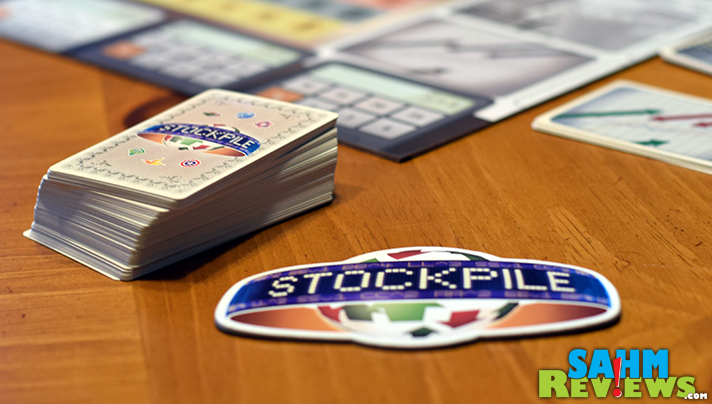 We like how none of these expansions shake up the basic game play of Stockpile, but add some randomness and variation to make it a little less predictable. We hope Nauvoo Games continues along this path with additional characters and maybe will delve a little into options trading! And I hinted about an upgrade. 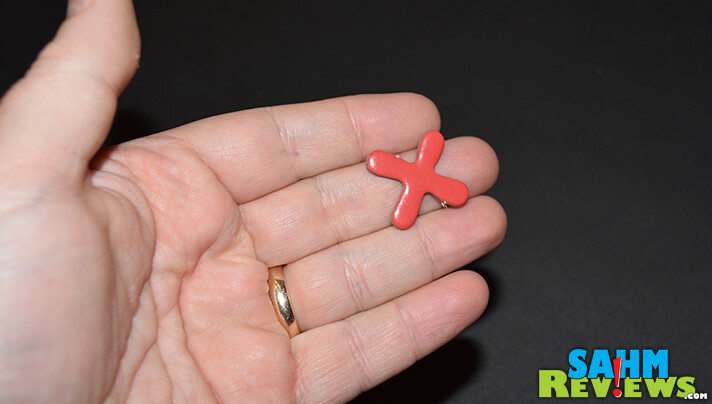 Previously I complained about the durability of the red “X” used to cover certain spots on the board. We’re excited to announce that Stockpile: Continuing Corruption includes beefier replacement X’s! 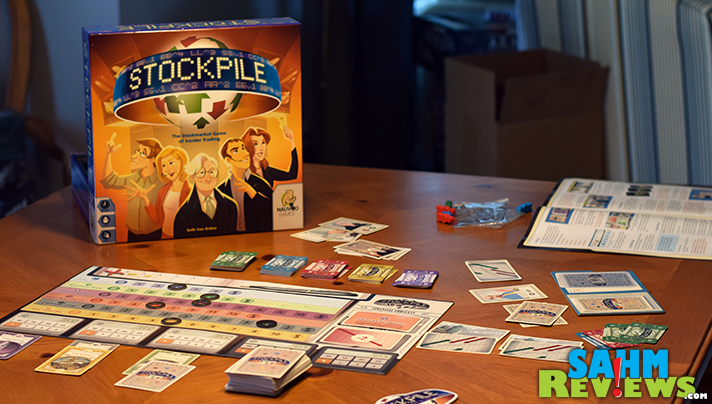 There are a few copies left on Amazon for under the $25 MSRP – if you own the original Stockpile, this is an expansion you’ll want to grab before they run out! I’m not a big fan of stock market games but if I have the chance will have a go at this. Looks interesting! Thanks Scott for the great review! FYI Stockpile second printing should hit shelves by the end of November for those that are currently out of stock. Have yet to play a game w/this mechanic. Could be fun w/the right group I spose. Thanks for another good review! This sounds like a good board game. My husband would be the one interested in this kind of game. Oh wow this is a really cool one! We usually play board games on nights when we’re all home. It would be cool to make-believe like we’re high stakes traders. You know whats funny? This would be SO a game my 12 year-old would love. He’s into the stock market like crazy, so this would be super fun for him! I had a giggle about you being about to go to a better university! ha! This sounds like an interesting game. I may have to check it out. I LOVED playing the stocks for fun as a kid. If my parents had listened… lol. We’re in the same boat! This sounds like a great game- for fun and learning! This looks really interesting. It would be worth checking out if you are into numbers. This looks like a fun aND entertaining game that my family would enjoy! I love that this game has a correlation between careers and business and game strategy. It definitely gets your competitive juices flowing. This game looks complicated yet fun! I love that it teaches kids a bit about the stock market itself. I’ll admit I could use a game like this to understand it better 😉 Have you posted a picture of your game closet yet, Scott? I’m dying to see it! Thanks again for such an amazing game review. I remember playing Monopoly as a kid. Stockpile also looks a fun game which I’d definitely play myself. Omg that game looks like so much fun. I have monthly game nights at my house and with all the drama Monopoly starts, I bet this would be much better. Nobody would know how to cheat cause its all new to us. I gotta look into this.